From Goodreads: Never tell Mac Faraday not to do something. 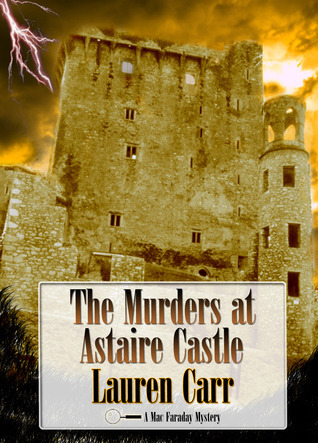 This is Lauren Carr’s first plunge into the world of the paranormal, and I must say, it’s absolutely thrilling! There is never a dull day in the life of retired investigator Mac Faraday, and finding out he owns a haunted castle piques his interest, regardless of what his friends tell him about leaving it well alone. And, with the investigation into the abandoned castle comes the appearance of a wolf man and the murder of two prominent celebrities, further stirring up the lore surrounding the disappearance of a horror author that once lived in the towers so long ago, creating many different avenues of adventure for both readers and characters alike. I love how seamlessly Carr is able to tie nearly everything together in the end, save the supernatural entities she evokes in this thriller, and as a paranormal and mystery lover, this novel is the perfect mix, providing enough evidence to explain away multiple happenings while leaving enough room for speculation for those a little more into the supernatural. Carr’s intense characters, Mac Faraday, David O’Callghan, Archie Monday, and Gnarly, take readers on another amazing crime scene adventure you won’t soon forget, just in time for Halloween. If you haven’t read any of the Mad Faraday mysteries and you’re looking for a novel that will keep you on the edge of your seat, then I highly suggest you start with this one as each Mac Faraday novel stands alone. And, once you start, you’ll want to read them all. Five stars. Acorn Book services has been extremely gracious in allowing me to read this novel, via Netgalley.